Dalai Mama: How to throw a fabulous kid's party for under $100! 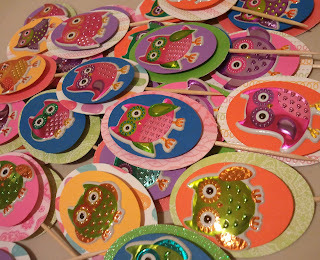 How to throw a fabulous kid's party for under $100! Today we celebrated Luci's 5th birthday. As hard as I tried, I couldn't find a place to have Luci's party this year. I really wanted to have it somewhere besides our house but, alas, I waited too long. With her birthday being the beginning of January, I, of course, waited until after Christmas to call around for party locations. I tried to find an open gym type place, but everywhere was booked. And I refused to settle for Chuck E. Cheese. Finally, I made the decision to host the party at our house. Since it's in January I wasn't sure what to expect with the weather. I really didn't want a huge parking issue with ice and snow so we decided on just inviting family this year. Next year though, I will make arrangements before Christmas! 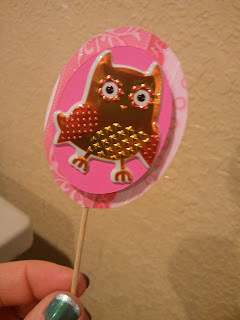 I asked Luci what type of party she wanted and she said she would like an owl party. Great, I thought! 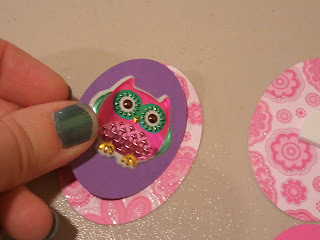 I love owls, I can do this with no problems! We went to Hobby Lobby and bought some owl stickers, glitter tulle, a cupcake holder, ribbon, flower ties and other assorted beautiful things. We spent roughly $45 there. Cut two different size ovals from card stock. I used 3" and 2 1/2". 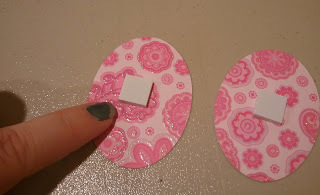 Attach a double sided sticky pad to the larger oval. 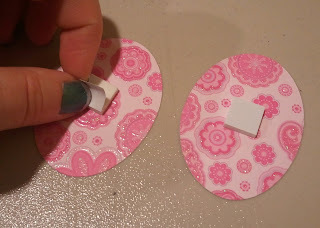 I love how simple these sticky pads are! They also give a 3-D effect. Add your sticker of choice to the smaller oval. 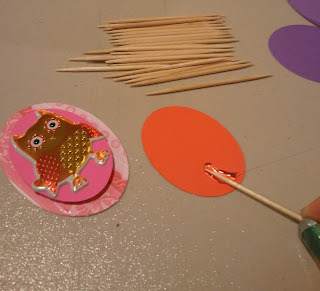 Stick the smaller oval to the larger one. With your trusty hot glue gun, run a small strip of glue on another small oval. 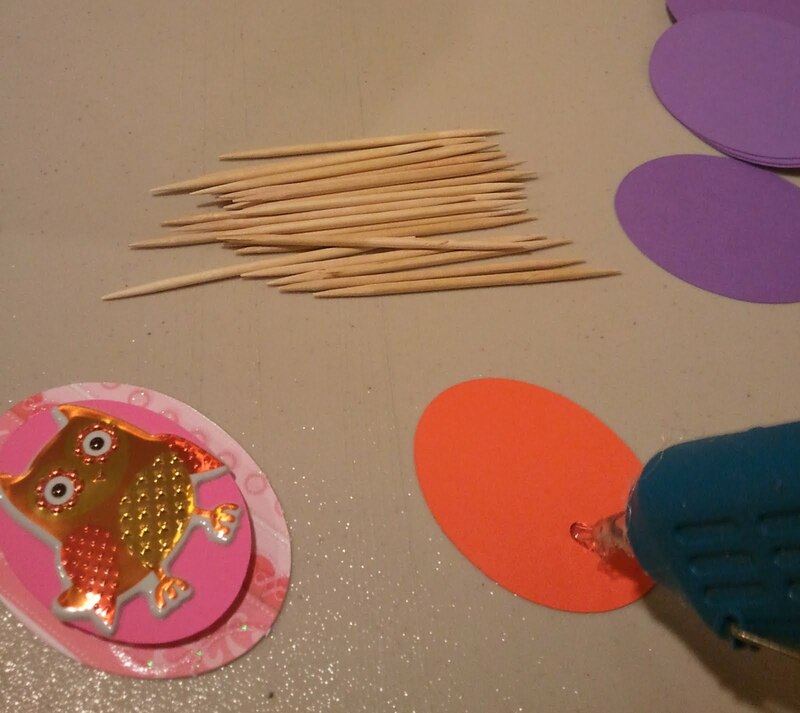 Attach a toothpick to the glue. 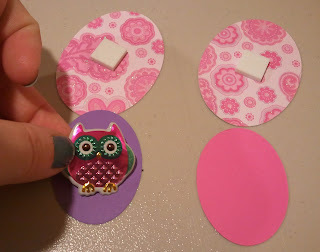 Place the two ovals together on the glue. For the cupcake holder, I had a few options. I could pay anywhere from $20-$30 for a metal stand that I had no idea where I would store it or I could buy the $4 cardboard, disposable stand that I could decorate myself. No storage needed afterwards! I just bought a bolt of pink and green ribbon and hot glued it to the stand. 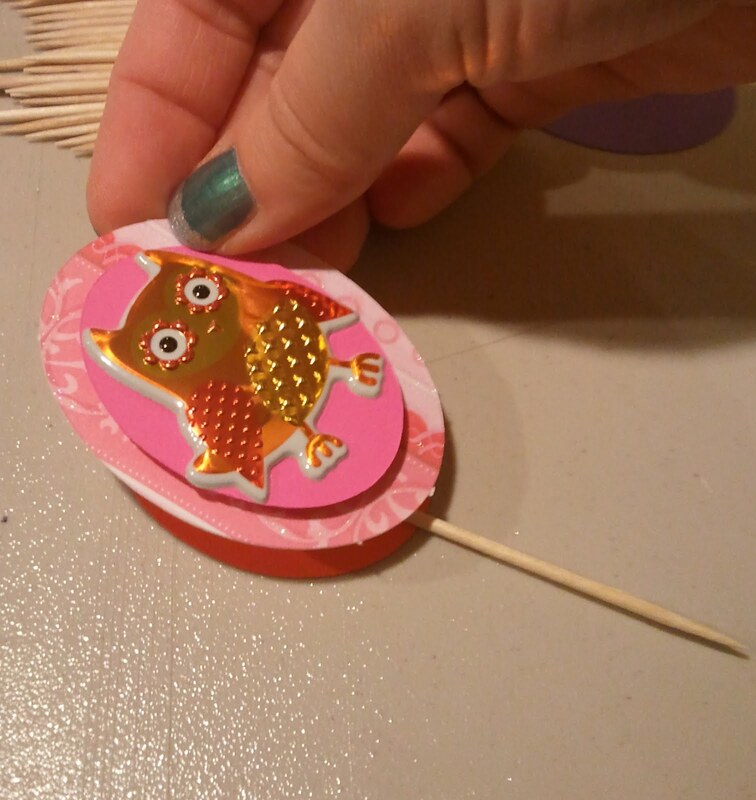 You have to do this with a pretty steady hand and quickly so the glue doesn't set up. Make sure to double check for glue strings after you are done. 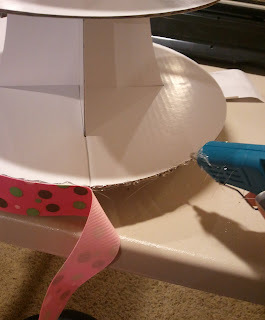 No one wants hot glue strings in their cake! Pretty cute if you ask me! 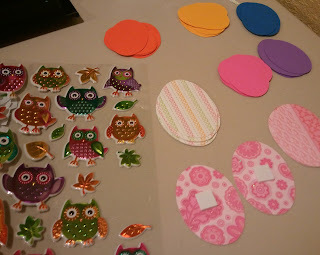 I had some owl fabric from my classroom that I brought home to use. I decided to use it as a table runner and cover for the food counter. I laid a strip of the leftover ribbon down the middle of the table and added the flowers. Luci got two dozen pink and green roses from her Daddy on Thurs. and they were starting to droop. Once roses have reached that point, I always cut them down really short and pack them in tight together. They will easily last another 4-5 days. I loved the way they looked in the stemless wine glasses! Dining room table with plastic table cloth, owl fabric, and ribbon. You can sometimes pick up open roses from the floral shop cheaper. Ask!! Here is how the food counter looked. We decorate around the cut-out with glittery tulle, balloons and hanging decorations. The owl cupcakes with DIY stand. These are so fun! I hung them from the curtain rod with the glittery tulle. I had some tulle left, so I made a long fluffy bow for the fireplace mantle. I also customized a flag banner that we found at Hobby Lobby. 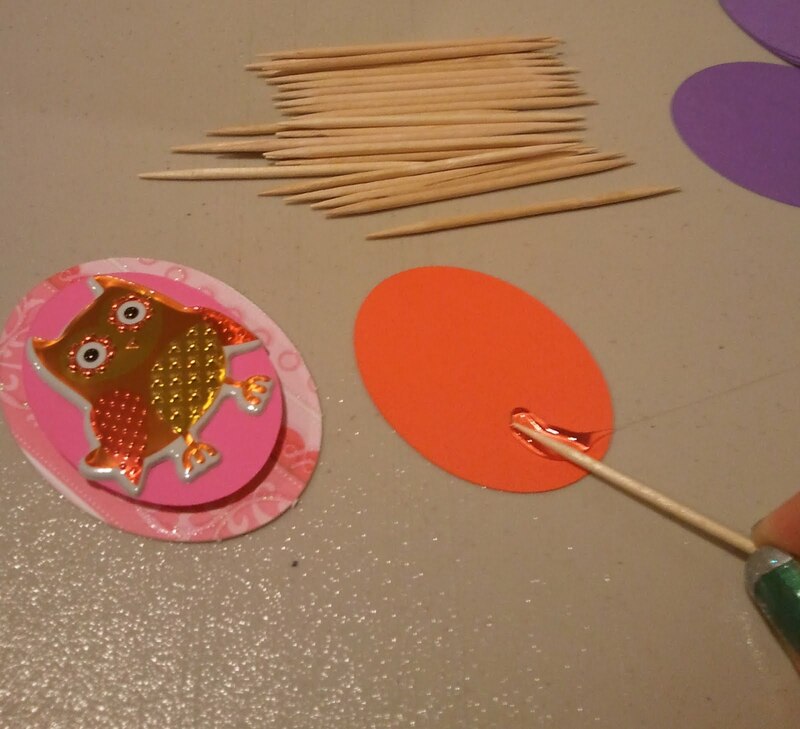 It was just plain flags and I cut 4" letters to say "Look Whoooooo's 5!" 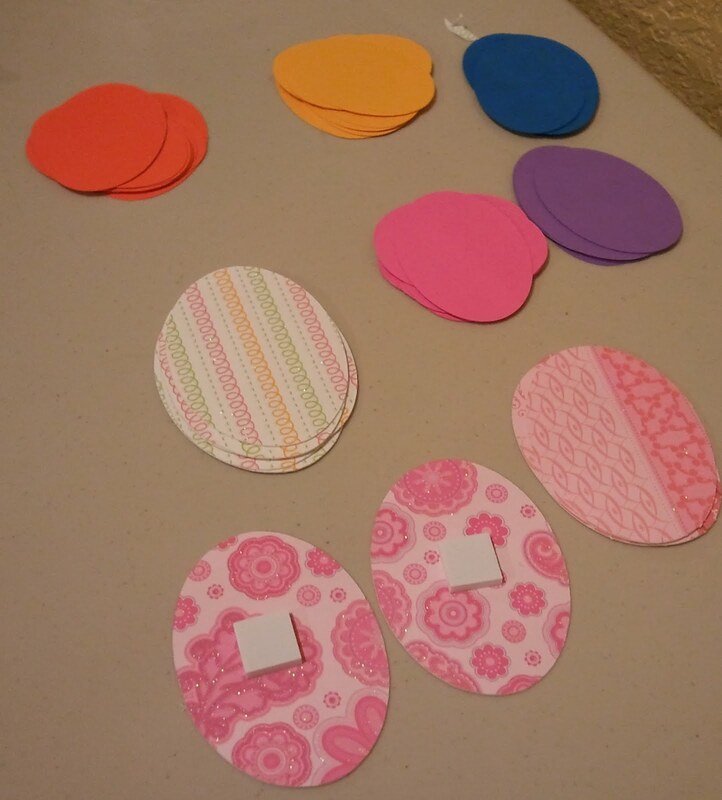 I used the double sided sticky square to attach the letters to ovals and to the flags. I hung these with thumb tacks above the french doors in the living room. 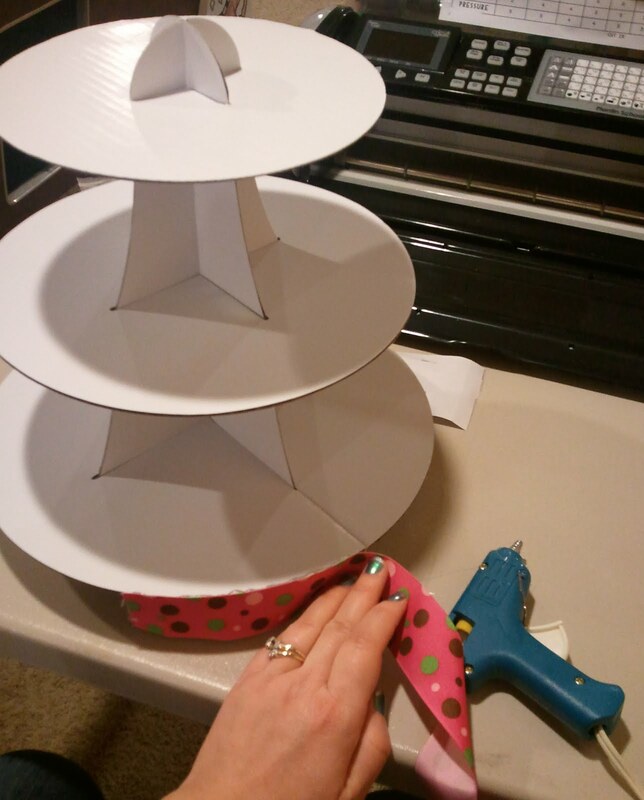 For the cupcakes, I got this idea that filled cupcakes would be fun, so I went to my friend Pinterest for ideas. I simply made the cupcakes as the recipe called for and then when they were cooled, I cut a cone shaped chunk of cupcake from the top and filled with about 1 tsp of raspberry filling. (I found a can of raspberry filling at the grocery store in the baking section.) Then I put the cone of cupcake back on the top and iced them. For food, I highly recommend an early morning party. We planned the party for 10am, this way everyone is happy and naps are not until the afternoon. (No crankiness.) And also guests can get on with their day. With an early morning party, we decided on serving a brunch. I bought bagels & cream cheese, fruit, quick muffin mixes and ingredients to make a crock pot breakfast skillet. For the muffins, I made them into a bread, so I could cook them faster. I made those the day before. I also decorated the house the night before, so I didn't have to race to get it done by 10am! Jake made the breakfast skillet this morning. One lb. of bacon, one lb. of sausage, 18 eggs, and a bag of cubed potatoes. He precooked everything, mixed it and threw it in the crock pot, topped with cheese. Breakfast skillet in the crock pot, just to keep it warm. Apple strudel muffin bread, blueberry muffin bread, bagels and cream cheese. 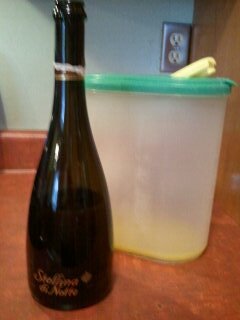 Still a half bottle of bubbly left. Hmmmmm, what's a girl to do?! And of course, what is brunch without a mimosa? I made two frozen containers of orange juice the day before. We also put out a bowl of mixed K-cups, tea bags and iced tea. I think that the party turned out great and everyone had fun. Luci loved seeing all the decorations going up. She kept running into the kitchen saying "Oh, Mommy! It looks beautiful in here!" It really did look nice, I am proud to say that I spent under $100 for all the decorations, food, cake, and drinks! 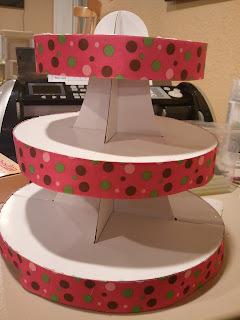 Feel free to share any ideas you have for party decorations! I can always use inspiration! Love it! Can't wait to have a little girl someday. Yay for pink & glitter! I know! Little girls are so fun! And they give us a reason to play dress up, decorate with glitter and watch Disney Princess movies! Cooking, Lounging, Pinterest, Adam Levine, Oh my!